And now for something completely different! A personalised item like no other. 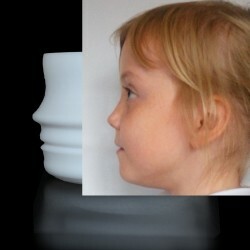 Send me a photo of your head in profile and I will reproduce your profile on the outside of a planter pot! As far as I know, UmmaGumma is the only company anywhere to offer this service. The planter will measure approx 90mm dia by approx 60mm high. Your photo should show your head in clear profile against a plain coloured background. See the example photo in this listing. Your hair should be kept back from your forehead and the front of your face. You will probably need to take a photo specifically for sending to us. Uploading your photo for your personalised planter. After placing your order please note your order reference number and then click on the "Contact Us" link under the Information tab at the bottom of the home page. Enter your email address, order reference and then click the "Choose File" button to locate the photo file on your system. You can enter a short message in the message box if you want and then click "Send". Alternatively you can just email your photo to info@ummagumma.co.uk quoting your order number.